Back in SF just in time for the primary. Yes that is a porta-potty next to the polling place. 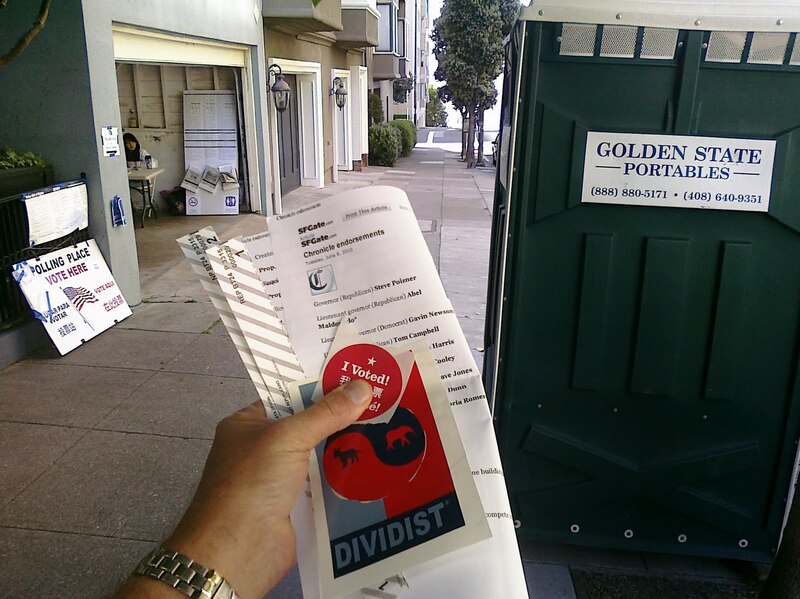 I asked if I could fill out my ballot in the porta-potty rather than the voting booth. It just seemed more appropriate. I also brought the Chronicle recommendations into the "booth" as a guide and in case there was not enough toilet paper. Voting directly opposite their recommendations is the right choice more often than not. As we are still living under the boot heel of Single Party Democratic Rule, I remain a Republican and voted in the Republican primary. MY choice - Chicks in Charge in California. I voted for Meg Whitman and Carly Fiorina. Neither are professional pols, and perfectly capable of making major mistakes in the pressure cooker of a major campaign (Remember Carly saying neither Obama nor McCain were qualified to be a CEO of a Fortune 500 company? It's true, but you don't say thing like that in a campaign). Regardless, they are both smart, mean, good businesswomen, technically savvy, and tough as nails. Exactly what we need in this state. With any luck, we'll finally be rid of Boxer - who is an embarrassment to California. I also voted for Prop 14. Not sure it's the right thing, but it'll shake things up, and that is a good thing. Your divided government blog is leaking like the Gulf of Mexico again!